Hall Piano Company Music Academy Students Receive Accolades in 2014 New Orleans Music Teachers Association "Romantic & Contemporary" Auditions. The New Orleans Music Teachers Association (NOMTA) Romantic and Contemporary Auditions were held Saturday and Sunday, November 15-16, 2014 at the University of New Orleans Performing Arts building. 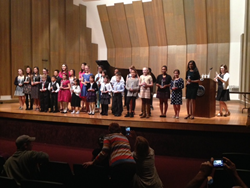 With over 201 total local participants, 18 students from the Hall Piano Company Music Academy were chosen to participate in the event’s honors recital, and 4 were awarded medals for their performances. Student recitalists of Academy Director Emily Fransen and Academy teachers Leah Mulholland, Kaitln Tholen, and Peggy Fransen included: Bentley Boudreaux, Rhea Chempakasseril, Vicky Chen, Stevie Kinchen, Neel Mondal, Priscilla Moradel, Patrick Murray, Lauren Nash, Jessie Pickens, Lainey Pickens, Destiny Sanders, Jenna Thomas, Steven Wang, and Louise Wang. Medalists included Sarah Fath, Nathaniel Kinchen, Sneha Mondal, and Elizabeth Murray. The Academy provides an opportunity for kids of all ages to explore music through the piano. From pop, jazz and classical to gospel, praise/worship and improvisation, our musical educators help their students discover abilities, set goals, and enjoy the musical learning experience. Steve Kinchen, co-owner of Hall Piano Company, said, “Recognizing the enduring value of music, Hall Piano Company hosts Open Houses and musical events several times through the year to let families explore their children’s interest in music. We’re giving back to the greater New Orleans community that has supported us since 1958.” Partnering with the Steinway Society of New Orleans, the Hall Piano Music Academy offers an annual scholarship to one Academy student; the scholarship funds one full year of private lessons. In offering this scholarship, Hall Piano Company hopes to create opportunities for every child. In addition to piano lessons, Hall Piano’s services include acoustic piano sales and rentals, piano moving and restoration, digital piano sales, and method books. Adult group and private lessons are also available. Hall Piano Company is south Louisiana’s premier Steinway & Sons dealer. For additional information about piano lessons and the Music Academy, contact Emily McWilliams at emilym(at)hallpiano(dot)com or call 504.733.TUNE.